I work with many clients who dread their annual work reviews with their bosses because it causes them either stress, discomfort, and for some clients, even anxiety and/or depression. As their clinical therapist, I help them uncover reasons why constructive feedback is a trigger for these feelings. I then help the client learn coping skills to manage the feelings that come from feedback whether it is from their boss, family, friends, or even their significant other. I recently read an article from FastCompany that touched on this very topic of how to deal with feedback from others, “How to train yourself to deal with criticism” by author Fadeke Adegbuyi-Doist. Doist describes that without this feedback from your boss, you are unable to improve your skills or perhaps your performance is subpar and unfortunately, no one is informing you of this. Doist also encourages that these meetings with your boss not to just be annually, but perhaps weekly or quarterly, depending on your work environment. Below are the 5 ways Doist explains in her article about coping with feedback from your boss. Make initiatives with your boss. Don’t wait for your boss to set up an annual meeting. Seek them out directly for feedback. Also, be sure to give them an agenda ahead of time for the feedback you are hoping to gain. Lean into the discomfort. I encourage my clients to lean into their feelings as often as they can, because most times when we avoid them, they become even stronger and harder to cope with. The same concept can be applied to meeting with your boss, lean into the conversation even if it is uncomfortable; the more we do something that causes discomfort, the easier it gets overtime (similar concept to exposure therapy). 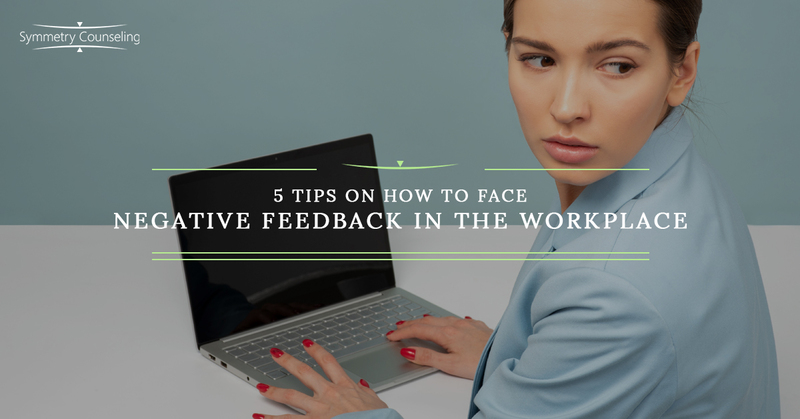 Attempt to use this as a way to grow and improve your work skills as your boss is simply just giving you beneficial feedback. Actively listen. Just like you may practice active listening in your personal life, attempt to do this with your boss. Not everything said to you needs a response, sometimes just listening without a response can help you to fully soak in what he or she may be saying to you. Attempt to send your defensive responses to curious responses. Try to be curious about what your boss is giving you feedback on. Feedback he or she provides you is not attack on you; remember your boss is just trying to help you improve because they value you in the company. Gratitude is key. While you may be uncomfortable hearing this feedback, your boss may also feel uncomfortable with giving it to you. Also, be sure to act on the feedback they give you, as it shows you are actively taking in what they said. Be sure to thank them for meeting with you, whether via email or with an active response. Advice instead of feedback. Sometimes people respond better to the word ‘advice’ instead of ‘feedback’ as it likely makes your boss feel more comfortable in sharing a personal story when they were once in your shoes. The word ‘advice’ can also help others feel less uncomfortable when giving feedback. It also can allow for a coworker to share a time they encountered a similar challenge. It gives feedback in a way that’s from a warmer place and also perhaps more action focused. If you are currently struggling with anxiety about an upcoming meeting with your boss, it may be a good idea to connect with one of our skilled counselors at Symmetry Counseling today. You can contact them at 312-578-9990 to set up an appointment.